Well, here's something I didn't expect; a roguelike that actually got me excited to play a roguelike. With a ridiculously high percentage of indie developers deciding that randomised levels are a clever way of padding out the amount of "content" in a game, and "roguelike" being the new indie selling point, even I, a committed fan of the actual Rogue, has become so very tired of seeing games listed as "roguelikes". But then Sky Rogue comes along and promises to be a roguelike by way of Ace Combat; an air combat dogfighting game with endless replay value. As a big fan of dogfighting games (and we see too few of them), this was a really, really appealing idea. The game has ultimately let me down, but I've still had an awful lot of fun with it. In Sky Rogue you take on a never-ending stream of increasingly difficult missions which are indeed randomised as per the "roguelike" principle. Some task you with taking down aerial targets. At other times you'll be executing bombing runs on ground-based targets. Then, when it's mission accomplished, you'll be given a pile of loot, which can use to customise your aircraft with better weapons (or planes), and you're ready to take on the next mission. This happens over and over and over again, with absolutely no narrative context, and then you'll finally be blown up, or crash. Then you'll be sent back to the first mission level, but don't fear! You would have also earned experience points from your previous run, which can be used to unlock more powerful stuff, to make your next attempt easier. Your standard roguelike stuff there. There's also an Endless mode, which works basically the same way as the arcade mode, described above... to the point where I question why the team bothered having an arcade mode at all. With no narrative giving context to the Arcade mode, it feels and plays just like Endless... only with an ending point. An inferior Endless mode, basically, and it was after playing both of these modes back to back that I realised the fundamental problem with Sky Rogue: it is so shallow that the developer itself had difficulty coming up with different ways to play the game. The randomisation is a nice touch, but at the same time lets the game down in comparison to other dogfighting titles. The very best examples of this genre are so tightly controlled to give players intense, balanced set pieces. Here, the action certainly becomes very difficult and intense, but with no way for the developers to control what the player experiences, it also lacks the critical rhythm and structured approach that set pieces offer. With no narrative setting the scene for the drama, the game feels hollow and lacking in direction. And while this might be a roguelike, and having random swarms of enemies is nice, the actual level design - such a hallmark of the roguelike - is restricted to the ground you're flying over. It doesn't really matter if one island is slightly differently shaped to the other, so a big part of the roguelike experience is rendered redundant instantly by placing it in the sky. It doesn't take long for the core gameplay loop to start to become draining, too, because it's so shallow. To put it simply, the game doesn't stretch far beyond "shoot things, return to base, by new weapons, shoot more things." Of course, that's true for many other games (and roguelikes) too, but here missions are so condensed in nature that it really draws the player's attention to how limited it all really is. 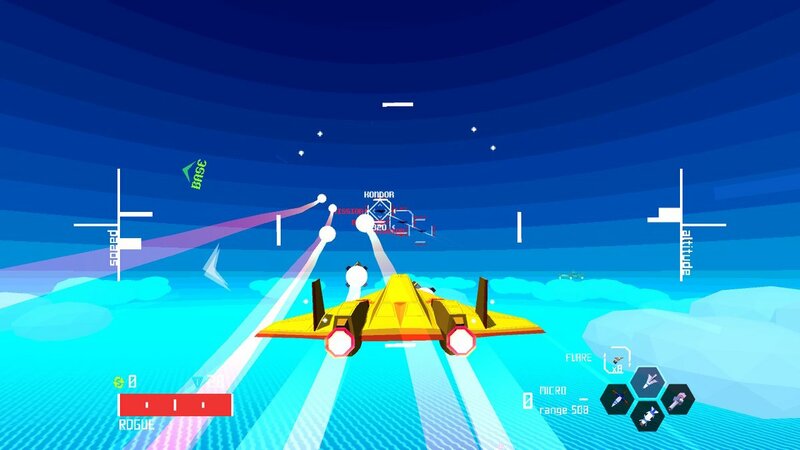 With no leaderboards nor narrative goals, there's also not much of a reason to keep playing, aside from the simple joy of flying around and engaging in dogfights. Fortunately for Sky Rogue, it absolutely nails the atmosphere of a dogfight. One of the reasons I love this genre so much is those moments where you execute the perfect sweeping bombing run on a ground target (with such a spectacular view of the ground and ocean around you as you do so), or perfectly executing loops, twists and turns to end up behind your opponent to take him/her out with machine gun fire. 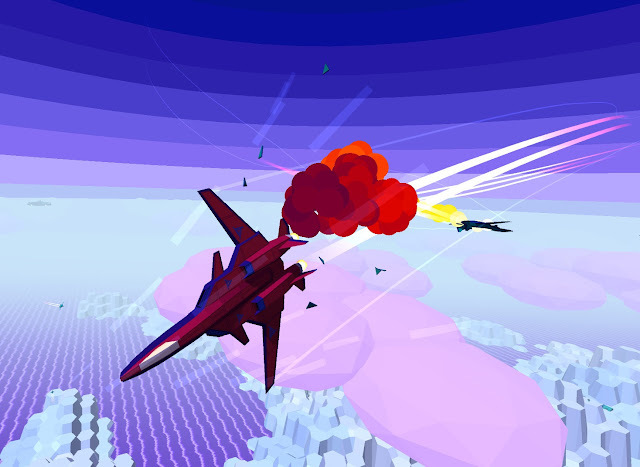 Sadly, Sky Rogue is a little heavily focused on the use of missiles rather than the more skill-based machine guns, and the incentive is there to use homing weapons rather than have to aim with precision. One of the things I love about flight sims is that the planes are moving so quickly that you actually need to aim where the plane is going to be a split second later, rather than where it will be when you fire the gun, and that's a skill I love mastering in these games. That being said, all the thrills of weaving in and out of bullet fire, building a full 360 degree awareness of what's going on around you, and mastering the turning angles on your planes are all there, are all executed to mechanical perfection. I also appreciated that there's both "arcade" controls, and a more realistic option where plane handling (particularly turning) will take some practice to master. Other nice touches include the ability to fly from a cockpit perspective (which takes away some of your viewing angles, but is, again, the more authentic experience), and the visual design of the game, which is bright, colourful and charming, while still providing a good sensation of scale as you battle through the skies. Finally, there's local multiplayer, and that is a really great feature, especially given how challenging the game can become. Being able to sweep around, watching each other's back and creating simple strategies to tackle objectives together is about the closest the game comes to providing context to the action. Sadly, the split screens do make things even harder individually because when you need to be able to see a full 360 degrees around you, having your viewing angle cut off can mean threats aren't spotted until its too late. It also makes seeing stuff on the Switch's screen too small to bother with, but from the comfort of the living room and on the big screen TV it's playable enough that the tradeoff is well worthwhile. If it just wasn't so limited. 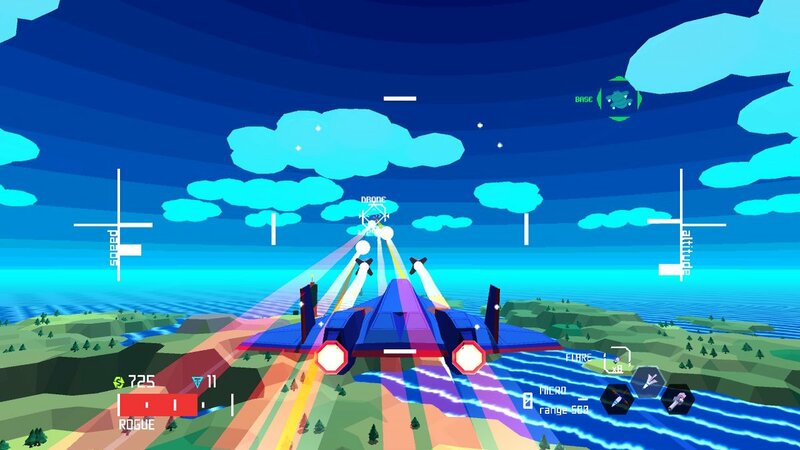 Well done to the developers for taking the roguelike to a genre that I would never have expected it would pair up with, and then executing it as well as any dogfighting flight simulator out there. But, while the loot grind is generally enjoyable, and the randomised missions help keep the missions from becoming rote, Sky Rogue does struggle to give you a reason to care about any of it. 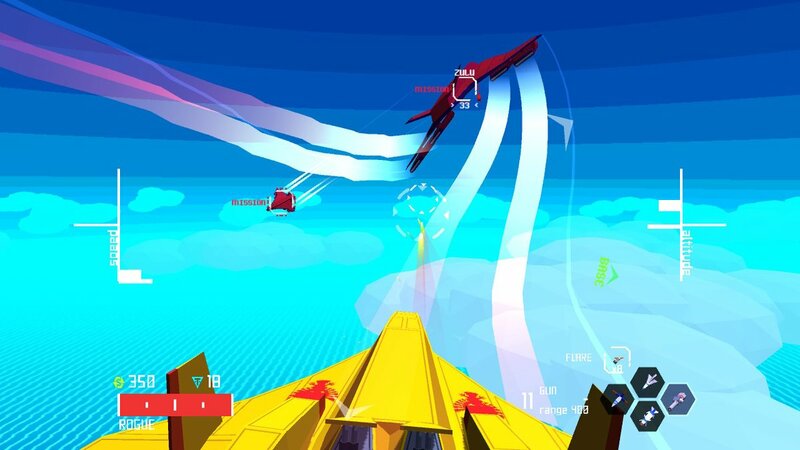 You don't need to have a masterpiece of storytelling, but giving players a reason for the action is important, and in not being able to even differentiate its two main play modes from one another in a meaningful manner, Sky Rogue ends up showing us just how limited it is, far too early for its own good.